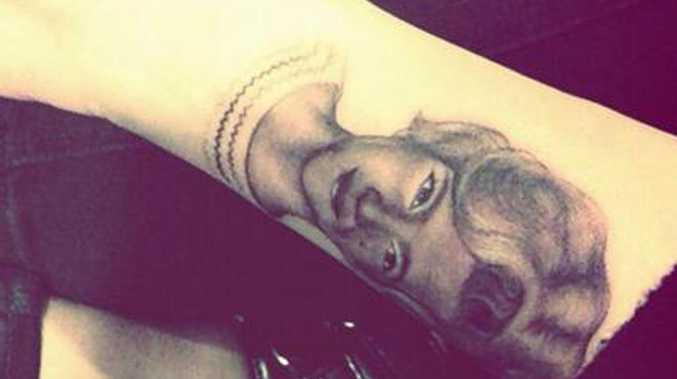 MILEY Cyrus has a portrait of her grandma tattooed on her arm. The 20-year-old pop star got the black and grey design of her maternal grandmother, Loretta Finley, inked by artist Kat Von D to commemorate their close relationship. The 'Wrecking Ball' hitmaker wrote on Twitter: "because i am her favorite & she is mine (sic)." She also added the image of her tattoo, which shows Loretta smiling with her wavy locks falling into short side-parted bob style. Miley also hinted she may be adding to her collection of tattoos after working on new material. She added: "Yesterday was a day of making music, tattooing, and hangin w friends... Gonna repeat that today! (sic)"
The 'We Can't Stop' star - who split from fiance Liam Hemsworth in September - got her first tattoo in 2009 at the age of 17 and has since built up an impressive collection of inkings. Most recently she got "Rolling $tone" tattooed on the soles of her feet as she wanted to do "something fun" during her interview with Rolling Stone magazine. Other notable designs include the Roman numerals VIIXCI - which stand for 7/91 the month and year her parents, Billy Ray and Tish met - and a quote which reads "So that his place shall never be with those cold and timid souls who neither know victory nor defeat." In addition, she has skulls on her ankles, a mini replica of Leonardo da Vinci's anatomical heart drawing on her forearm, the Hindu ohm symbol and an anchor on her wrists, as well as a tattoo of the words "just breathe".